As I sit here watching the State of the Union address by President Obama I am struck by the number of standing ovations that the president is getting and I am not sure why they keep standing after every sound bite? With the approval ratings of Congress at an all time low of 9% (11/2013) and presidential approval ratings 42% I simply don’t understand why they continue to applaud themselves and their leader. 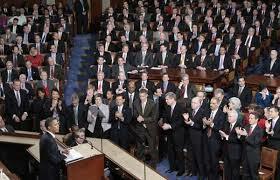 How would the State of the Union Address be different if the audience was filled with the american people? My guess is a helluva lot shorter and much more concise. When you and your colleagues are gridlocked and all you do is fight in a bipartisan manner at the cost of your constituents I think it is best if you stay seated because failure to get results as a leader is really a sign of dis-ease. This is not a blog about being a democrat or a being republican … this is about leadership. PreviousPrevious post:Celebrate Your Goals?NextNext post:I Can’t Believe This!!! !